This CITC DMXtra! 250055 Wireless Transceiver Set includes a male 5-pin XLR and a female 5-pin XLR transceiver. They are constructed of stainless steel and plastic. Each 8.5" (inc. antenna) accessory weighs 5.5 oz. and has an 1,800 foot line-of-sight range. A 5 VDC Adapter is included for each unit. DMXtra! 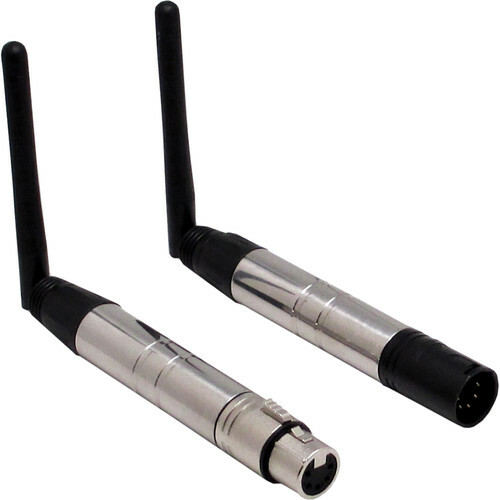 250055 Wireless Transceiver (Set 5-PIN 1-Male, 1-Female Connector) is rated 4.0 out of 5 by 1. Rated 4 out of 5 by Anonymous from Simple, useful and a good price. Already used it several times... Even through walls. What is the secret to get these transceivers to sync up? Tried for hours and they never turned the same color even after countless times rereading and following the lame directions. Can't find any tech support for this product online. Wondering if there is a way to reset them. I think you need to sync the colors before you plug in your dmx signal. There's an inset button on each. You can press it with paper clip or toothpick. If memory serves... They will possibly change color after signal is hooked up but should still work. Try that. I don't have mine handy or I'd check it now. Garth.